The feast that accompanies the Super Bowl is usually as epic, if not greater than the game. As a Chicago Bears fan I can only think of 2 Super Bowls I actually wanted to see the game more than the food. I would like to add only 1 of the 2 worked out the right way. Another great element of the Big Game feast is the left overs for lunch the next day. 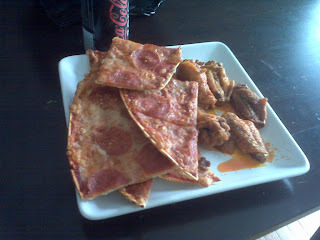 As you can see some left over pizza and hot wings. You must pay close attention to the grease and juice that is oozing from the wings. This ensures the leftovers are providing the highest of nutritional value for you. This is the topic for the picture of the day.